After six months or more of working on a series of stitched pieces I finally decided it was time to wrap things up. I put away the sewing supplies, sorted the fabrics I was using back into their color coded scrap bins and moved on. For months I've been saving things I wanted to add to my art journal and thinking about taking a different tactic in approaching my art. So far I'm incredibly frustrated, but that will be another post. I've created several new journal pages that I'd share. This is just one of them, but getting the rest of the pictures sized for posting will take me a little while. Which is okay, really, as it will give me something more to post over the next week or two. When I started this journal I went through and cut windows and page edges and other things, and collaged various papers etc. randomly throughout. The other day one of my co-workers was wearing an outfit in shades of teal and copper that I really liked and I wanted to do a page spread with those colors. 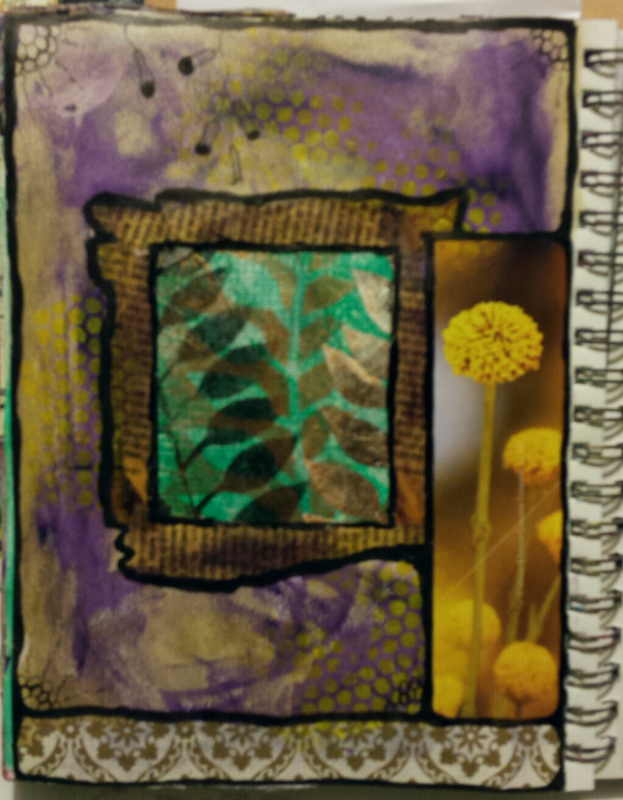 I thought they would like nice on the pages with a window peeping through to an unfinished spread in purple, bronze, and old paper. I'm sort of channeling Michelle Ward here, as I decided to try cutting out a mask/stencil of a leafy front and apply it in different ways on the page. Loved the effect! More to come. Right now I have to go bug the lovely ladies as SAQA for advice on another issue. Too much to do, not enough time, and I don't want to spend all day at the computer! LOLOL. Last December I got together with a few friends to work on Artist Trading Cards (ATCs). This is my first set! 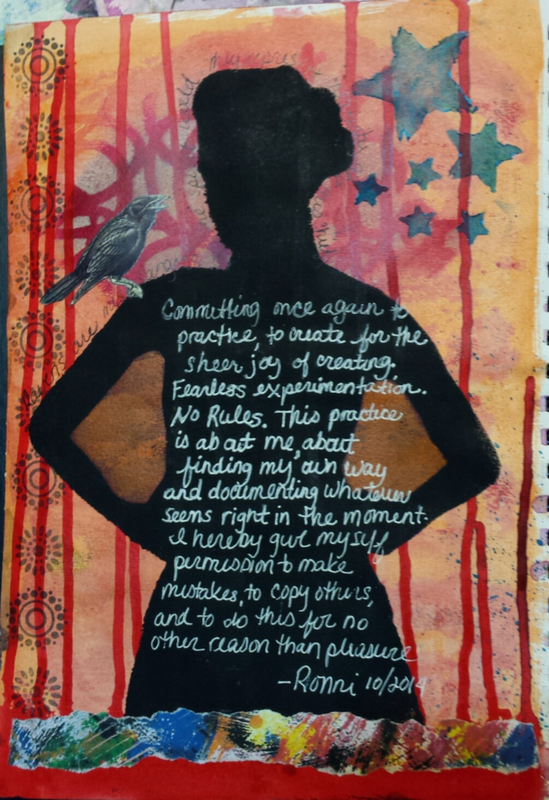 A year or more ago I was playing with collaging in my art journal with colored tissue paper, some of which I had stamped with black acrylic paint. 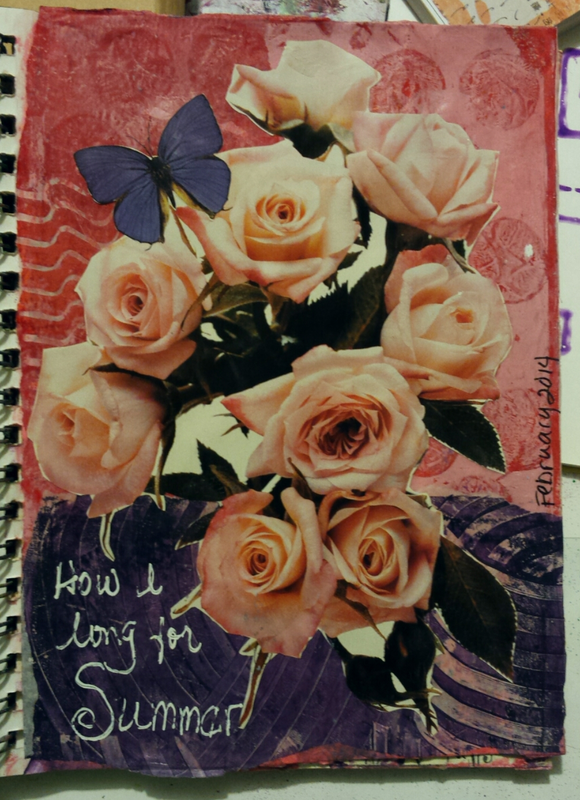 I no longer recall why exactly, but I ended up tearing the pages out of my journal and cutting them into ATC sized pieces. 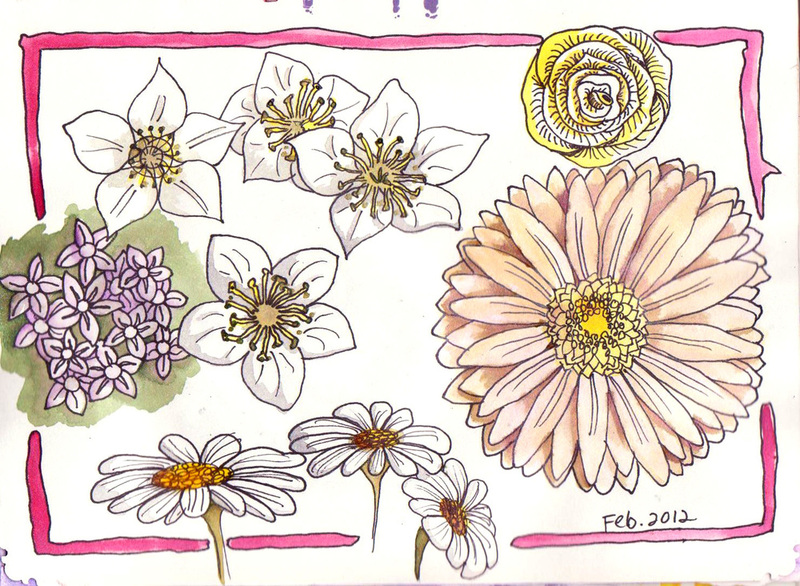 I also cut up the smaller bits into inchies that I have yet to use. Sometimes it seems so insane to cut or tear up papers I've spent a long time working on but I so often find that the resulting bits are much more interesting than the whole. Months after all that I came across these 18th C. images of women with these amazing (and frankly, really ugly!) hair styles. Did you know that women actually wore things like live birds in their hair during this period?!! Ping! I had to use these images on those backgrounds. The women are printed on cheap watercolor paper because I thought the texture was nice. They took me forever to cut out and the whole project languished until my friend put together the ATC party. 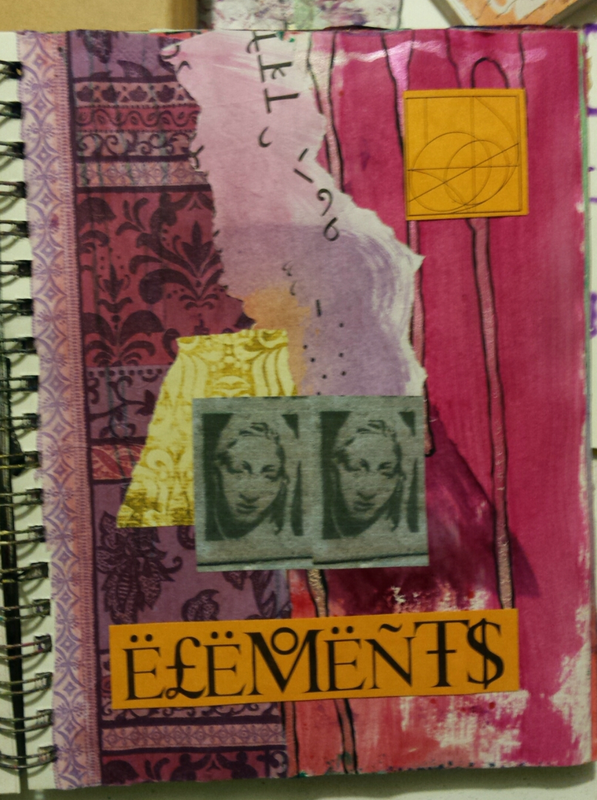 The lovely damsel's are edged with gold pen and glued to the background with Collage Pauge. There are three sparkly pink and gold stickers on each card. After gluing some pretty scrapbook paper to the back I ran each edge through a puddle of gold acrylic paint to color and seal the edges. Finally I coated the fronts with gloss medium to seal the ink jet ink and make sure it all stayed glued together. Here's a picture of my work table covered with the tissue paper I stamped with acrylic paint. It looks so cool when used in collage. So here is a sticky, and probably tacky, question. What to do with my ATCs? Trade them, right? I got to peruse my friends collections of trading cards and frankly most of them stunk. Cheap color printouts and bad kitch that I don't want. What do you do if you go to a ATC swap and someone wants to trade for one of your cards but they have nothing you want? I don't want to hurt anyone's feelings by saying their work isn't good enough, but I do want to collect art that appeals to me. Also, while my cards may not be the worlds greatest, they took me a lot of time and work and I want to trade for equal value. From the collections of cards I've seen it seems like a lot of people get into it more for the social aspect than the art aspect. After thinking about this for a long time I've more or less decided that the actual trading part of making ATCs is probably not for me. I really enjoyed making them though! Another couple of pages. Naturally I have only photographed the pages I like. Maybe someday I'll get brave enough to post the uglies too. First I have to accept that they exist! Some of the collage elements on the Crazy Love page came from Kelly Kilmer. 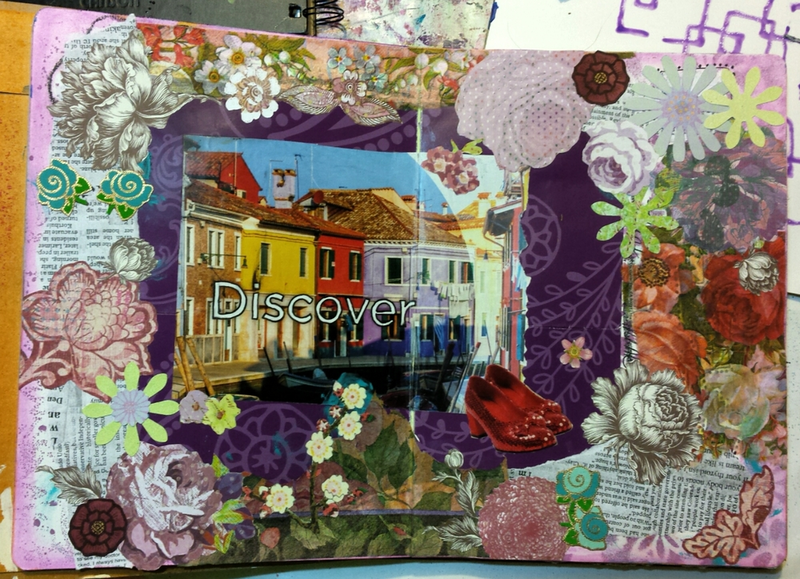 I took one of her on-line journaling classes and she gave the class collage pages. The other page was a result of testing various pens and inks I have in my stash to see how they felt to write with and how waterproof the ink was. I also played with an edge punch on this page. 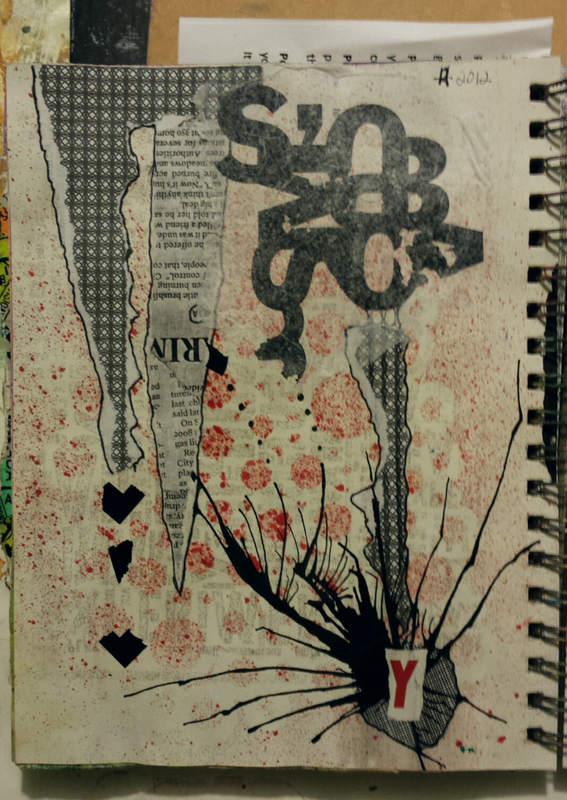 It's kind of a messy page but I like it for some reason. I have a terrible time finding pens I like for journaling. Half of the ones I try won't write over paint and glue. Most of them aren't waterproof and I always end up regretting that fact. The best pen I've found so far is my Copic marker but I don't like the chisel tip or the brush tip for most things. I bought a fine point Copic pen but it doesn't seem to work as well. Other artists swear by this pen or that but I have not had such good results. Maybe it's because I live in such a dry climate. There's nothing like an early morning blog ramble about pens huh? 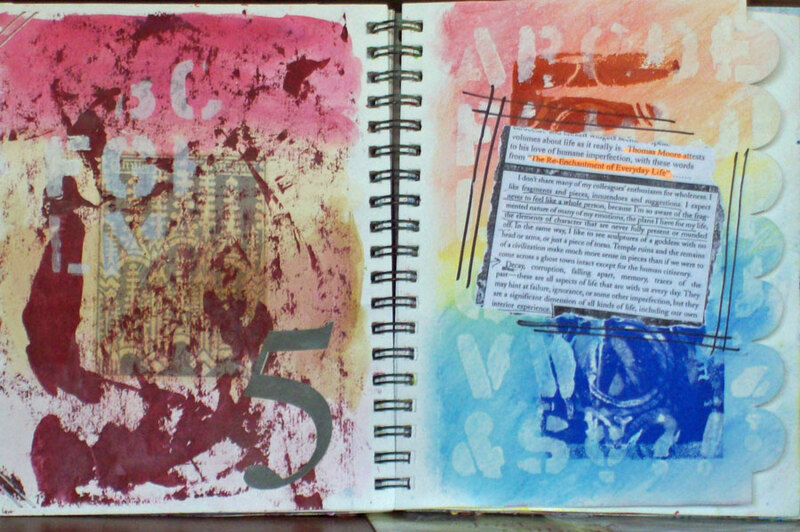 These are pages from my art journal. I decided to collect images in color schemes that I don't normally work with and make a collage with them. All these images and scraps came from magazines or catalogs, with a few bits of scrap paper thrown in. 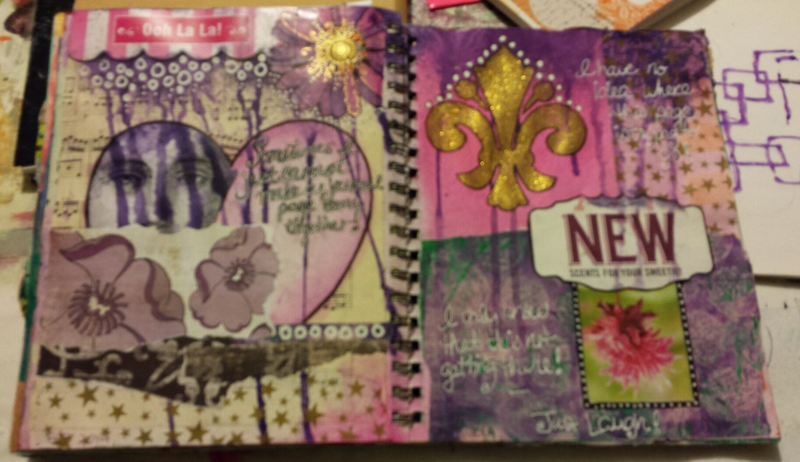 I am so often disappointed with my journal pages but I ended up really loving these collages. It was a great way to change my perception of these colors. 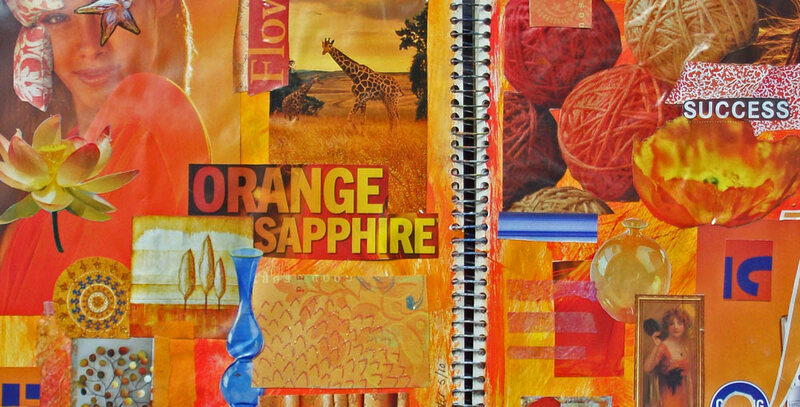 Now I find myself using orange and yellow green in more of my work. 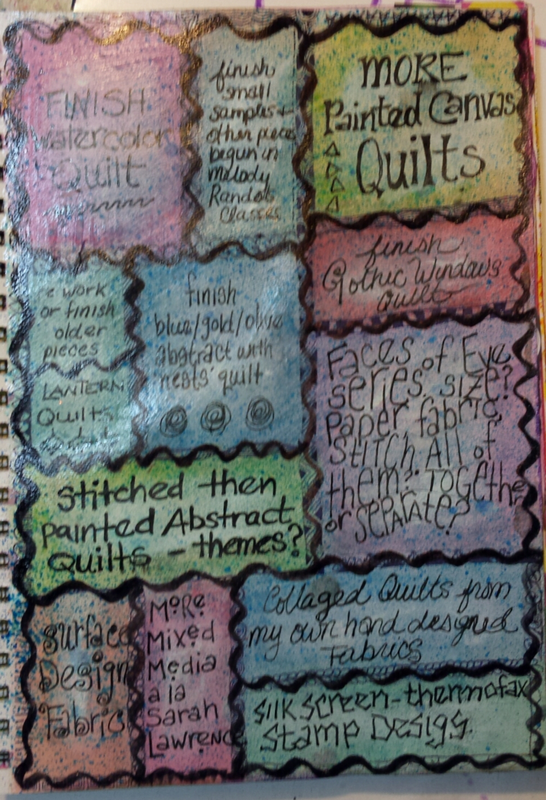 These could also make fun concepts for a art quilt. Hmmmm. Here is a new piece that I finished a little while ago. Getting the pictures taken and edited for posting takes me forever! The down side of bloggin! LOL. This began with a piece of fabric-paper in shades of red and purple, which is a favorite color combination. So many of my pieces begin after experimenting with a technique I want to try and this is no exception. This is a remnant of my first piece of fabric-paper, made a couple of years ago. I also wanted to to try printing images on silk. I chose one of Leonardo da Vinci's drawings and was really pleased with the way it came out. This piece includes embossed velvet (so much fun! ), embroidery, beading, and stamping (with acrylic paint). 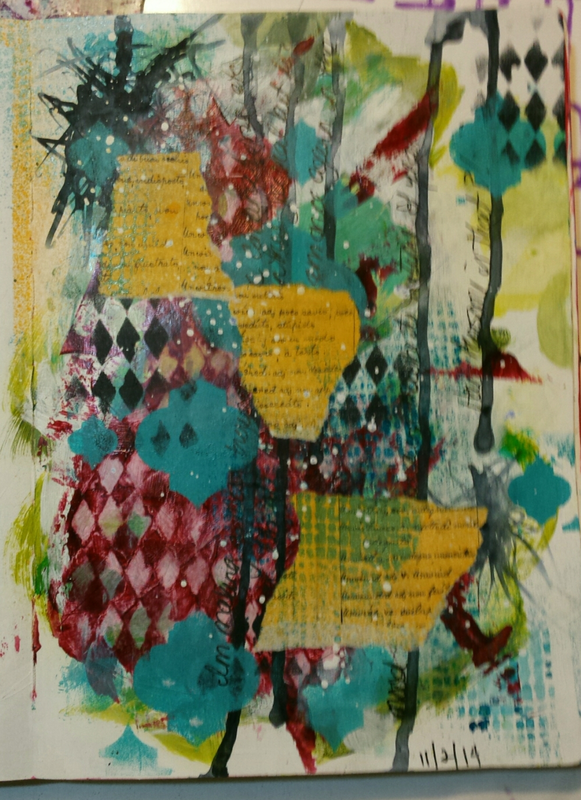 Here is a new mixed media piece that I recently completed. 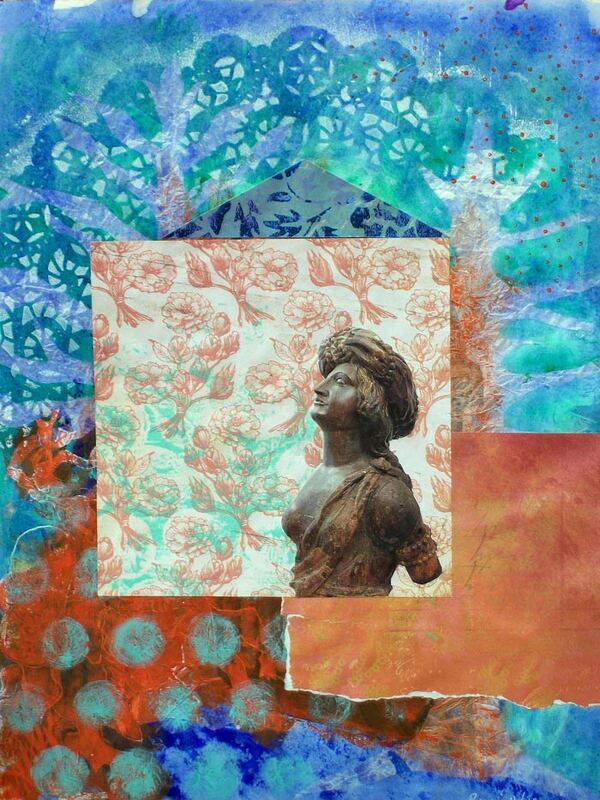 In the March/April 2011 issue of Cloth Paper Scissors magazine there was an article by Susan Pickering Rothamel and Frankie Fioretti about making restructured paper using Perfect Paper Adhesive. 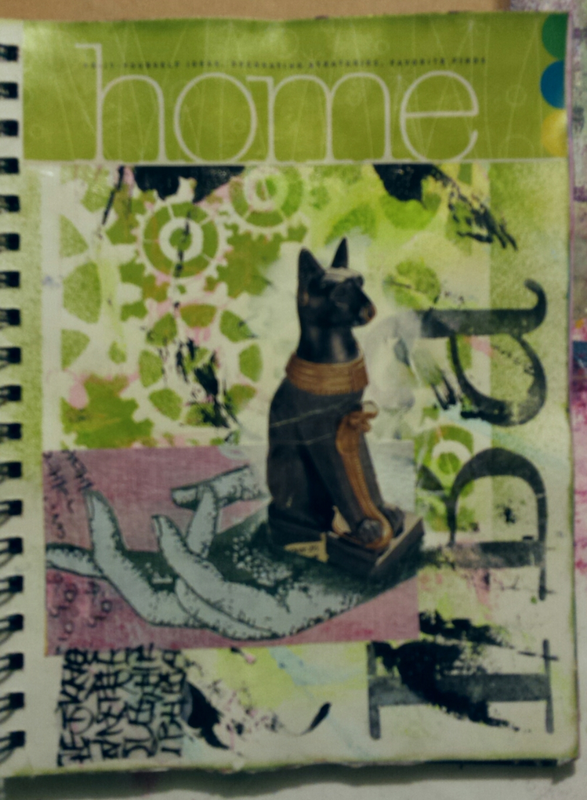 As a collage artist and art journaler I had about a ton of scraps so I thought this project would be just right for me. I was totally thrilled with the outcome but could not decide for quite a while what I wanted to do with it. It was so pretty just the way it was that I considered calling it finished but in the end I decided to try adding some flowers. I did all this work creating and stitching down some paper flowers and hated the way the looked. LOL! So I carefully cut the shapes out, leaving square flower shaped holes. 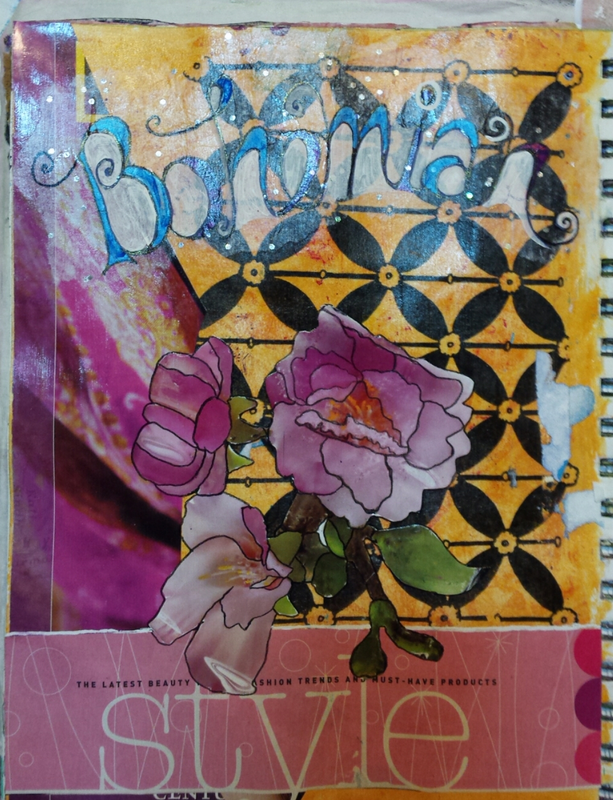 I like the way the collage paper looked on a background of black brocade so I added some batting to the back, secured the whole shebang with fusible webbing and stitched it down with gold thread. The flower centers are pieces of black card stock that I cut, folded, and edged with gold Smooch ink. I mounted the whole thing on a small canvas that I painted with various antique-y colors, and stenciled with punchinella. In this detail picture you can see some of the black on black brocade and the little gold spiral I stitched in various places. The Perfect Paper adhesive is really great to work with and I find myself using it in my journals as well. My pages don't stick together like they do when I use matte medium. Yea!